Analyzing and communicating with artistic means forms the core of artistic research and offers a multitude of methods and competences to public and professional spheres. The majority of artistic research projects impact on public contexts by contributing to both innovative and socially engaged solutions. Artistic research often functions as a bridge between the process of creating artworks and explaining, processing, and positioning them in a public framework. Artistic research is – more than in established fields of research – transdisciplinary and involves the public as central stakeholders. 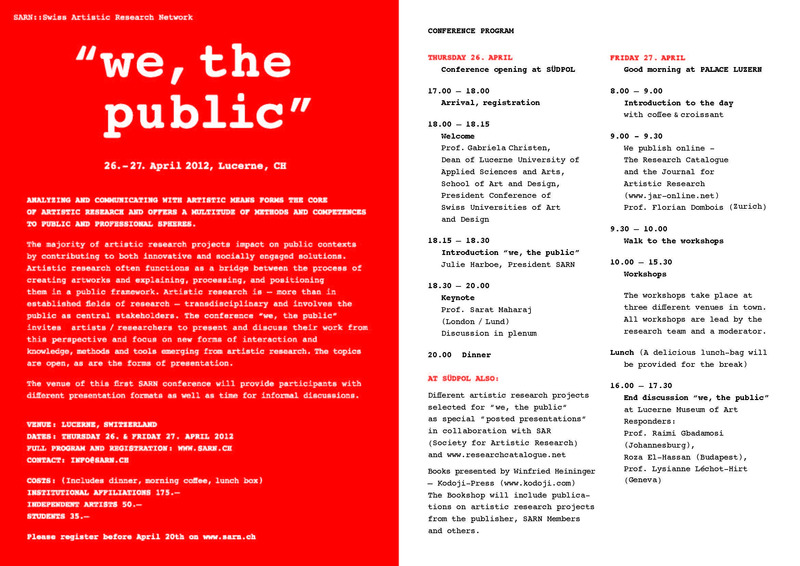 The conference “we, the public” invites artists/ researchers to present and discuss their work from this perspective and focus on the new forms of interaction and knowledge, methods and tools emerging from artistic research. The topics are open, as are the forms of presentation. Listen to the keynote lecture "Six impulses on art research" from Prof. Sarat Maharaj here.